The Beekman Hotel just opened in 2016, but because it sits inside the 150-year-old Temple Court Annex, one of New York City’s original skyscrapers, it looks like it’s been around for all of modernity. Plush leather banquettes and upholstered arm chairs line the bar. There’s a perimeter of old bookshelves. Portraits of Edgar Allen Poe hang on the dark walls. It also just so happens to be one of the few places left in the city to order what once was an iconic Manhattan dessert: the Baked Alaska -- a dish that’s just as old as the Temple Court Annex itself. Pastry chef Abby Swain’s version of the confection has become the signature item at Temple Court (formerly Fowler & Wells), Tom Colicchio's restaurant inside The Beekman. The restaurant, like the hotel, pays homage to old Manhattan, and the Baked Alaska -- though now difficult to find -- once was the epitome of Gilded Age, New York opulence. However, this 150-year-old dessert isn’t just a flamboyant stunt food: there’s a history behind the Baked Alaska that’s just as complicated as keeping ice cream solid inside a 500-degree oven. And in an age where showstopping food has the propensity to go viral, it may just be poised for a comeback. 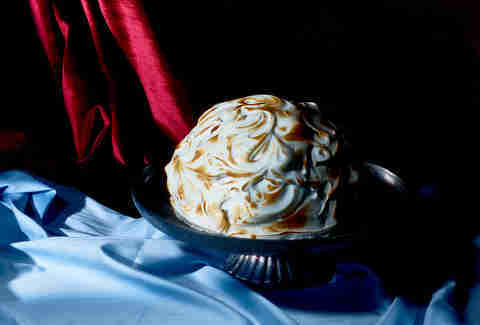 For those unfamiliar, the Baked Alaska is one of America’s oldest desserts -- dating back about 150 years. However, the presentation and preparation seem like something you could find on a modernist cuisine menu, right alongside a foam tomato sauce or sous vide eggs. Satisfying desserts take a lot of work to perfect every step. Thankfully when you open a pint of delicious Talenti, the work is done for you. 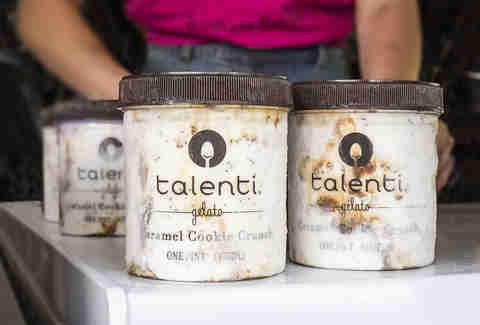 Try the new Talenti flavors at your leisure: Cinnamon Peach Biscuit Gelato, Peanut Butter Fudge Sorbetto, Vanilla Chai Gelato, and Vanilla Blueberry Crumble Gelato. To make it, you first need a thin layer of cake -- it’s usually a sponge. Then, that’s topped with ice cream that’s been frozen inside a mold for hours, making it harder to melt -- but not too hard so you can’t get your spoon into it. Then, meringue is piped high around the ice cream mold as a sweet insulator. Traditional recipes will have you stick all of that in a super-hot (450-500º F) oven for all of five minutes, just enough time to brown up the meringue, but not long enough to dry it out or melt the ice cream. Other than that, there are no specifics on ice cream or cake flavor, or even which style of meringue you should use. Swiss and Italian versions usually hold up better than a traditional French meringue -- and are food safe. For a Swiss meringue, sugar and egg whites are whisked together, then heated over a pan of boiling water. Italian versions are fussier, as a hot sugar syrup is whisked into the egg whites while still piping hot. In modern versions, the ice cream can be swapped for a lighter sorbet. While the oven is traditionally the go-to for achieving the “baked” aspect, it’s not really the most effective in 2017. It’s more common for pastry chefs to whip out their trusty culinary blowtorch to give the meringue it’s golden brown, singed peaks. Or, you could just douse the Baked Alaska in alcohol and light the damn thing on fire. The story goes that Ranhofer served the Alaska, Florida (his original name for the dish) at Delmonico’s starting in 1867, as a nod to the Alaskan Purchase that happened that same year. But there isn’t a ton of evidence to back that up -- except that Ranhofer included the Alaska, Florida recipe in his cookbook, The Epicurean, published in 1894. A journalist, writing about his experience at Delmonico’s, also described eating a similar “Alaska” in the 1880s. Paul Freeman, a Yale history professor and the author of The 10 Restaurants that Changed America, says it wouldn’t have been out of the ordinary for Ranhofer to name a dish after something like the Alaskan purchase. At the time, the purchase had garnered the nickname “Seward’s Folly” because several Americans believed spending a lofty $7.2 million for the frozen tundra was a waste of cash -- especially right after the Civil War. “It’s something that everyone is talking about,” Freeman said of the purchase in 1867. So making a clever pun on the current events wouldn’t have been out of the ordinary for Ranhofer to do. But while Ranhofer is normally credited for the Baked Alaska, it’s more likely he first came across a similar version in Paris. Its counterpart, the omelette à la norvégienne (ice cream, sponge cake, and toasted meringue -- but named for Norway, rather than Alaska) had been around for several decades, too. There are other origin stories: similar recipes appear in The Philadelphia Housewife in 1855, and Count Benjamin Thompson Rumford is quoted saying he discovered the technique as early as 1804 in The American Heritage Cookbook. Even Thomas Jefferson specifically requested that the ice cream he served at a White House Banquet in 1802 be covered in a hot pastry. 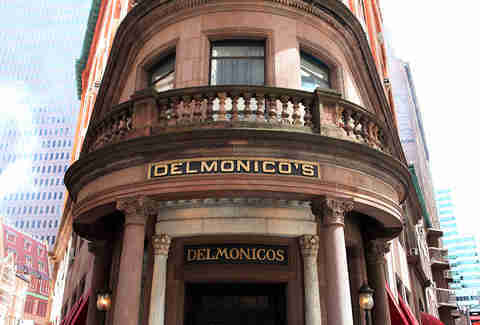 But the reason why Delmonico’s claim has the most staying power may just be because of the restaurant’s influence. Long before Freeman included Delmonico’s as one of the most important restaurants in the United States, The New York Times had already called it. And not only that, but Delmonico’s was the epitome of Gilded Age dining -- and the Baked Alaska would have represented that new opulence. “All sorts of dishes were being produced that catered to the huge creation of new wealth after the civil war,” Freeman says. Ice cream dishes, in particular, were actually considered a luxury item at that time, says Cathy Kauffman, president of the Culinary Historians of New York. “Any sort of ice cream dish was considered very, very fashionable. It was on virtually every menu in the late 19th century from anyone who had any pretension,” she says. Why? Well because no one was making it at home. It was a luxury. So how did a dessert known for its first class opulence end up at the height of its popularity in the ’50s? While the Baked Alaska was still prevalent at fine dining restaurants and high-end banquets, for the first time, it may have been something accessible for home cooks to attempt. With the advent of electric mixers and reliable ovens, suburban home cooks had the tools to pull it off. And, of course, they had Betty Crocker. 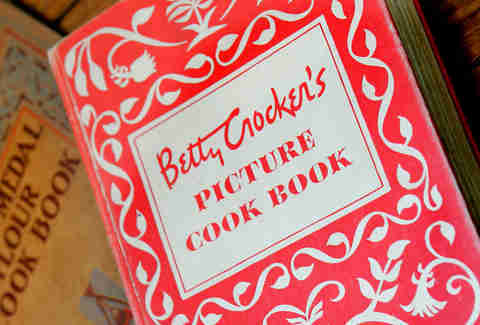 The Betty Crocker Picture Cookbook was first published in 1950, and instantly became a bestseller. It was around this time that several cookbooks would debut that would eventually be considered culinary bibles for home cooks. Shapiro says that Betty Crocker’s, in particular, was the book most everyone had in their kitchen. And, it included a recipe for the Baked Alaska for home cooks. Granted, it’s described as “a dessert of beauty and mystery” -- but an easy-to-follow recipe was in the homes of millions of Americans. 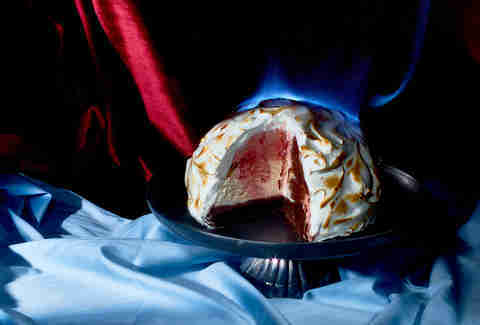 Eventually, though, the Baked Alaska would give way to the Black Forest cakes of the ’70s, and fade away. Still, there are some restaurants that are featuring the dessert on their menus. Take DBGB Kitchen and Bar, where the Baked Alaska is their signature dessert in both the Washington DC and NYC locations. It takes them nearly a week to prepare for a weekend’s service -- each day consisting of freezing a layer of ice cream, first the pistachio and vanilla, then the raspberry sorbet, into long logs. Then they make the cake layer, a vanilla sponge, which is piped with meringue to order, before it’s covered in kirsch brandy and served to the customer still flaming. “The background of DBGB, it’s kind of Daniel [Boulud’s] interpretation of the American table meets French bistro. So the idea was to put something that Americans could identify with,” executive chef Nicholas Tang says. Serving it flaming, executive pastry chef Jayce Baudry adds, was their way of incorporating French fine-dining showmanship into the dessert menu. “In the last 10 years in pastry there has been a movement where everyone was taking back old desserts, in French, in America, and they try to reinvent them,” Baudry says. It may be making a comeback in home kitchens, too. In 2016, Deb Perelman’s Smitten Kitchen, a food blog for home chefs with about 6 million unique views, featured a Baked Alaska recipe for her 10th anniversary post. Just two years before that, the recipe was a “signature challenge” on an episode of The Great British Bake Off -- a show that features amateur home bakers who compete solely for bragging rights. That episode was one of the most scandalous in the show’s history, as one of the contestants mistakenly removed another’s dish from the freezer -- essentially sabotaging him. Bingate, as the ordeal was called, was all over the British tabloids for weeks. And in an age where a pizza covered in tacos is bound to go viral, and we spend our time watching 30-second food videos of showstopping desserts, something as elaborate and photogenic as the Baked Alaska could be on the verge of making waves in the culinary social media world. Her take on the Baked Alaska is loosely based off the flavor profiles of a German’s Chocolate Cake. First, there’s hot fudge added to the plate, then a slice of blackout chocolate cake nestled in it. A praline icing is spread across that, then her homemade bourbon pecan ice cream is molded on top. An Italian meringue is piped around it, which, when torched, tastes almost exactly like marshmallow fluff.